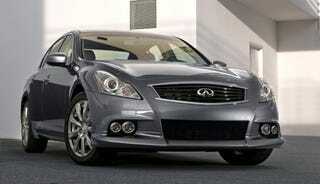 Infiniti Performance Line: Your G37 Needs Moar Power! Infiniti recently filed a trademark for the names "IPL" and "Infiniti Performance Line" for an upcoming AMG-like division offering "high-performance motor vehicle parts." It could launch as early as this summer. Twin-turbocharged G37S anyone? That trademark listing by Nissan North America was filed in February and lists this under "Goods And Services:"